And for night? There’s fancy gear too. Try a luxe velvet boilersuit with your favorite pointed slingbacks for instant happy-hour readiness. 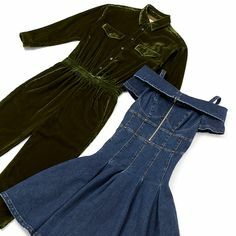 And if you’re feeling fresh, give a firm nod to that runway trend for all things '80s eveningwear with this Madonna-would-be-proud corset denim dress with cold-shoulder detail.